The original MOTU 828, launched in 2001 and reviewed in SOS July 2001, has proved to be an incredibly popular Firewire audio interface for both Mac and PC users wanting multiple channels of analogue and digital I/O. It has now been superseded by the more sophisticated 828 MkII, which brings with it 24-bit, 96kHz recording capability, improved connectivity and hardware metering. As before, MOTU's Mac-only Audiodesk multitrack recording software is bundled with the interface, and offers a multitrack recording and processing environment not dissimilar to the audio side of Digital Performer. You also get the Cuemix utility, which can set up the mixer for computer-controlled or stand-alone operation, and this has evolved to include some original features added since the manual was written, so you need to download the latest PDF files to find out how these work. Perhaps most important is the addition of control surface support for devices such as Mackie Control, though Talkback and Listenback have been also been added, which is welcome news for anyone operating a separate control room and studio. The best news is that despite the many improvements, the price is now £100 lower than the old 828. Housed in a rather more stylish 1U rack case than its predecessor, the 828 MkII features eight analogue inputs on balanced jacks, 10 analogue outputs on balanced jacks and two combi jack/XLR mic/line/instrument connectors (with individually switchable phantom power), which are now on the front panel for easy access. Insert send jacks for these two channels are fitted to the rear panel, and any free outs or ins can be used as aux sends and returns. Gold-plated connector contacts are used throughout and the converters are 24-bit, 64x oversampling with 96kHz capability. The analogue input jacks can be individually switched to either +4dBu or -10dBv sensitivity and up to 6dB of additional digital gain is available if needed. Further digital I/O is catered for by a pair of Toslink/ADAT lightpipe input and output connectors, which provide eight channels at 44.1kHz and 48kHz or four channels at high sample rates, and stereo S/PDIF in and out on dedicated RCA phonos, which can also be duplicated on the optical I/O. A standard ADAT 9-pin sync socket is provided for the sample accurate sync'ing of an ADAT or ADAT-compatible recording/playback device and there's now both word clock in and out on standard BNC connectors, so if you have a master clock unit, there's now somewhere to plug it! Usefully, the word clock circuitry can also follow and generate high and low sample rates so that, for example, you could be running at 44.1kHz but still lock to a double-speed 88.2kHz clock, or vice versa as selected in the MOTU Firewire Audio Console. The other welcome addition is a second Firewire socket, which makes life easier when you need to chain peripherals. New to the 828 MkII are MIDI I/O, word clock support and SMPTE sync. Other niceties include MIDI In and Out, on-board SMPTE sync for those rare occasions when MTC isn't what you need, and the ability to use the unit as a stand-alone mixer. As with the original 828, there's a rear-panel footswitch jack that can be used to punch in and out in Audiodesk and other compatible audio applications (this can be set to emulate any keyboard keystroke), a headphone output that can follow any output pair, a master level control that governs the headphone and main out level and Cuemix zero-latency monitoring. Having a physical output level control is particularly useful for anyone using active monitors without a mixer, as this provides them with a means to adjust their monitoring level. The main outputs themselves are equipped with 128x oversampling converters and may be used to provide a main stereo output feed, or they can carry the zero-latency cue mix. Cuemix can be used to send the signals being recorded directly to the outputs rather than monitoring them via the computer, so that they can be heard without any delay, albeit with no added plug-in effects. Having said that, MOTU have made it easy to connect a hardware reverb unit for monitoring by adding an effects loop controlled by an aux send. Cuemix is also useful for monitoring MIDI hardware instruments directly rather than via aux channels set up in your sequencer, though of course you don't get zero latency with software instruments as their sound is generated inside the computer. As supplied, the 828 MkII comes with multi-channel ASIO drivers for Mac and PC as well as a Mac OS X Core Audio driver. If you total up all the 828 MkII's I/O possibilities, you get a maximum of 20 inputs and 22 outputs at up to 48kHz, though the ADAT I/O channel count is halved when working at high sample rates. The original 828 had no MIDI I/O, whereas the MkII has one MIDI In and one MIDI Out, which communicate with the host computer via the Firewire cable, though on the Mac platform, MIDI is supported under OS X only. MOTU claim that the MIDI timing is as accurate as the host software allows. The two front-panel combi sockets accept XLR mic connectors, balanced or unbalanced jack line connectors and high-impedance instrument connectors (usually unbalanced). Each input has its own Trim control for level setting and a miniature toggle switch to turn on phantom power for use with capacitor mics or active DI boxes. Also on the front panel is the headphone jack, which by default shares the same level control as the main stereo outs. This is not always what you want, but you can also assign the headphone out its own signal source and level control if you need to. The SMPTE input is on a standard quarter-inch jack, and a similar jack provides a SMPTE output for when the 828 MkII is operating as master. A DSP-powered phase-locking system is used in combination with filtering to achieve fast lock times and sub-frame timing accuracy. One of the included pieces of software is called MOTU SMPTE Console, and provides the means to control the SMPTE functionality of the unit when, for example, sending SMPTE to stripe tapes. SMPTE sync works with any host applications, Mac or PC, that support the ASIO 2 sample-accurate sync protocol. Note that the 828 MkII has been designed to allow you to use multiple units together, but whether this is possible depends on the operating system of the host computer and/or the audio software you're working with. In theory, under Mac OS X, users can slave the MOTU driver to another Core Audio driver — either MOTU or third-party, which includes the Mac's built-in audio — for accurate sync. However, certain audio programs, including the current versions of Logic and Cubase, don't as yet allow users to select multiple audio interfaces under Mac OS X, a situation that both Emagic and Steinberg need to sort out without further delay. The Cuemix software is, in effect, a control panel for the 828 MkII's on-board DSP, which runs your mixer setups without imposing any load on the host CPU. The Cuemix DSP section of the control panel controls the internal DSP mixing facilities and also allows Global settings to be adjusted. If you're hooked up to a computer and you try to use the front panel to change something that you should be adjusting via a software control panel, the two-line, 16-character backlit LCD window prompts you. As a stand-alone mixer, the 828 MkII can sum all the inputs to a stereo pair and up to four simultaneous mixes can be run, each feeding a different output pair. This could be useful in setting up a couple of alternative monitor cue mixes, for example. Computer-free use is made possible by the six rotary encoders on the front panel where their values, levels or parameter names are shown in the display window. All six DSP section encoders and the level knob have integral push switches for confirming operations or toggling between modes. Using the DSP section, up to 16 mix presets can be stored and recalled. The 828 MkII's LCD can be switched between Setup and Mix modes by pressing the Setup knob, and in Setup mode you can choose whether the optical I/O is ADAT or S/PDIF, you can choose the digital sync mode, set the headphone assignment and so on. Back in mixer mode, the LCD shows the settings for the current mix, where the two lines of characters become two lines of tiny faders. When something is adjusted, the display temporarily 'zooms' in on this parameter while it is being adjusted and the time the display takes to revert to normal after adjustment can also be changed by the user. The Cursor knob scrolls through the 20 possible inputs while the Value knob adjusts their settings. Because the 828 MkII stores Cuemix settings when disconnected from the computer, you can save desired mixes, complete with default pan and gain settings, then make changes from the front panel if necessary when the interface is being used as a stand-alone mixer. At its simplest, this would allow you to rehearse via the 828 MkII in your studio without needing to boot up the computer. The ability to run four separate mixes simultaneously adds to the 828 MkII's flexibility. Mixes may be named and the settings include levels, pan positions, mute and solo settings. 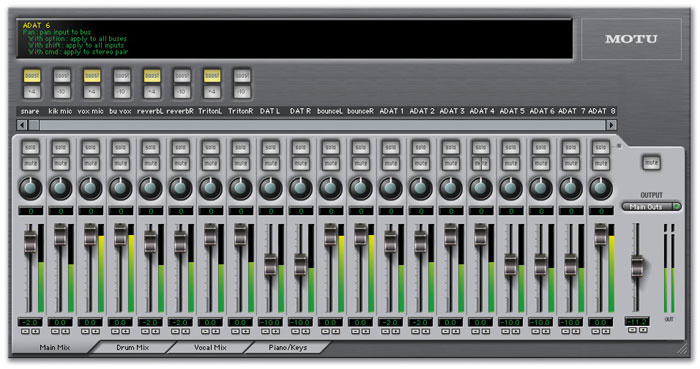 Mix 1 can be routed directly back into a computer input, which makes it easy to mix back to a spare stereo track of the software. This is a useful option where you may be using external MIDI synths that need to be added back into the final mix. I've always appreciated that MOTU hardware generally installs and runs without any problems, and though there was a little initial delay in supporting the Mac OS X platform (which was as much due to the changing nature of OS X as anything), the drivers MOTU have come up with are rock solid in my system. The current OS X driver is v1.09 (which also works with the old 828), and this is also happy with dual-processor G5 machines. The halving of the ADAT channel count at high sample rates is a function of the way the ADAT interface works, as it was never originally designed to handle anything higher than 48kHz — any other piece of gear with ADAT I/O has the same limitations so this it not a MOTU issue. The mic amps, while not in the 'silly money' quality bracket, are the equal of what you'd expect to find in just about any well designed small mixer, and being able to get at them on the front panel makes life a lot easier when the 828 MkII is mounted in a rack. It's also handy being able to plug a guitar directly into the interface, especially if you have a software modelling amp plug-in to process it with. The instrument inputs work well and are creditably quiet in use. I always liked the sound of the original 828 and the MkII's converters sound, if anything, fractionally better still, so there are no complaints in that department. Obviously you can get better results using audiophile converters that cost around the same as a family hatchback car, but these are pretty good. I have to admit that while my old 828 is still perfectly adequate for most of my needs, the 828 MkII's metering is a lot nicer, with LED signal-present monitoring of the analogue, mic and S/PDIF outputs, and either four or five-segment bar-graph metering of the analogue ins, S/PDIF in, main stereo out and mic inputs. Also in the display section is an indication of the current clock rate, the digital lock status of the interface and SMPTE activity. And of course the old 828 didn't support high sample rates. Cuemix Console is a simple but visually stylish and functional piece of software that handles mixing within the 828 MkII, either in conjunction with, or independently of your host sequencer program. It can take care of latency-free direct monitoring, and as it mixes using the DSP chips inside the 828 MkII, it doesn't tax the host software. Although modern computers are now so fast that latency is seldom an issue, it's still nice to be able to set up zero-latency monitoring for the benefit of those performers who are very sensitive to even a few milliseconds of delay, and the ability to mix without a computer is great if you just need to plug in a mic and a guitar for rehearsals. Setting up a mix using small assignable controls isn't as quick as on a conventional mixer, but it's pretty straightforward. The only obvious compromise in the 828 MkII's design is that the optical S/PDIF I/O uses the same connector as for ADAT-compatible devices, so you can't use both at the same time. Most studio gear seems to have co-axial S/PDIF connectors, in which case this won't be a problem, but if you do have S/PDIF equipment with optical I/O and need to use it at the same time as the ADAT I/O, then you'll need to buy an optical-to-co-axial adaptor to work around this limitation. Though I can't see anybody buying an 828 MkII who doesn't already have software to run with it, the bundled Audiodesk is actually pretty sophisticated if you only need audio recording and mixing capabilities, and because it runs without a physical dongle, it is ideal for live laptop recording. It is based on the audio recording and editing side of MOTU's flagship Digital Performer package, so it's not a toy by any means. The 828 MkII is a definite step up from the original 828, adding to the original feature set considerably while trimming the price. The front-panel mic amp inputs, improved metering and high sample-rate support are all welcome, and while not everyone will need the DSP mixing facilities, it certainly doesn't hurt to have them. The word clock input will also be welcomed by those users who were frustrated by the lack of it on the original 828, there's now full SMPTE support and of course the I/O count is slightly higher. If you need a bomb-proof audio interface that will work with almost anything, then the 828 MkII will not disappoint, and if you need more analogue I/O, there are now several choices of third-party eight-channel 'mic amp to ADAT' boxes from which to choose. As a satisfied 828 user myself, I'm now looking for an excuse to upgrade! While the main review text demonstrates that the MOTU 828 MkII is an excellent solution for the Mac-based musician, the unit is, of course, also aimed at PC users. Although the Audiodesk recording software is only available for Mac, all the other key features outlined in the main review text still apply within a PC context. In addition, as the majority of users would probably be integrating the 828 MkII into an existing recording/sequencing environment with applications such as Nuendo, Cubase SX or Sonar, the loss of Audiodesk will probably not be a major issue for most PC-based potential purchasers. I was able to test the 828 MkII with both desktop (2.6GHz Pentium 4 with 1MB RAM) and laptop (2.0GHz Pentium 4 with 512MB RAM) systems, both of which were running Windows XP. Driver installation, which has to be done prior to connecting the MOTU to the PC, proceeded without a hitch. The review unit was supplied with version 3.1 of the drivers but a newer version (3.3) was available from the MOTU web site as a 2.6MB download, and I used the latter in testing on both systems. Using the laptop, the only (very trivial!) problem I encountered was the need for a six-pin to four-pin Firewire cable, as many laptops feature the more compact four-pin Firewire connectors. MOTU do supply a healthily long 10 foot six-pin to six-pin cable, and this worked fine with the Firewire PCI card in my desktop PC. The performance of the 828 MkII was excellent when tested with both Reason (v2.5) and Wavelab (v4.01b). The system felt very responsive and there were no glitch issues even at a very comfortable 128 samples-per-buffer setting. Real-time performance of soft synths within Reason via the MOTU MIDI In was perfectly acceptable. I could easily imagine combining the 828 MkII with a Firewire-equipped PC laptop to form the core of a very respectable mobile recording setup. With the desktop PC I was able to test using Cubase SX (v2.0.1.10), Sound Forge 7, Wavelab (v4.01b), Acid Pro (v4.0d) and Reason (v2.5). In using all these applications, I only experienced one minor problem. At the 128-sample buffer setting, playback within Wavelab produced some minor glitching using the ASIO drivers. This disappeared at higher buffer settings and was also not an issue when using the MME-WDM drivers. As Wavelab had functioned fine on the laptop system, I'm inclined to think this might have been something specific to the hardware or OS setup on the desktop PC, rather than an issue with the 828 MkII or its drivers. In all other respects, the MOTU system performed flawlessly. Indeed, once hooked up, use within SX was totally transparent. All the various inputs and outputs were available via the SX VST Connections dialogue. Configuring the various analogue outputs to feed a surround sound monitoring system within either SX or Acid also worked without a problem. Playback of commercial recordings, from jazz through to nu metal, demonstrated that the quality of the analogue output hardware is very good. Recording both vocals and acoustic guitar with a mid-priced condenser mic via the front-panel XLR inputs also produced very pleasing results — crisp and clear highs and solid lows. For all but the most demanding of studio environments, the audio quality of the 828 MkII is very respectable indeed and, with all the usual due care and attention in other areas of the signal chain, the 828 is perfectly capable of producing commercial/broadcast-quality recordings. I can only agree with Paul White's comments in the main review that the MOTU 828 MkII offers some significant improvements over the original 828. While one would expect that the audio quality has moved forward in the three years that separate it from the original, perhaps more significant is the improved functionality — and in particular the additional controls available via the front panel. These really do make the unit much more flexible. While the Audiodesk software is not available to PC users, the useful Cuemix application is, and functions in the same fashion as on the Mac. Although I did not have the opportunity to test the GSIF drivers, the WDM and ASIO drivers seem very solid indeed, making the 828 MkII suitable for use with all the current crop of major PC audio applications. Essentially, whatever you want do to, the MOTU does its best not to get in the way, whether you're working on PC or Mac. As Paul commented about the original 828 back in his July 2001 review, this is a 'does exactly what it says on the tin' type of product. If the combination of analogue and digital connectivity fits your particular needs, I'd have no hesitation in recommending the 828 MkII, and if I could justify upgrading my own rack-based audio interface at present, the MOTU would most certainly be on my shortlist. Excellent I/O support with high sample-rate capability. Can be used as a stand-alone mixer. Optical S/PDIF and ADAT I/O share the same socket. The MOTU 828 MkII is a significant improvement on the well-respected original 828 offering better metering, word clock in and out, SMPTE support, enhanced I/O capability and good hardware metering, all for £100 less than the older model.